Forgotten Tech As World+Dog gets its head around Windows Vista, lets look back at an operating system that might have been a contender, very nearly becoming Apple's next-generation OS and, but for Linux, almost certainly the key alternative to Windows in the x86 world. Ladies and gentlemen, who remembers the Be OS? BeOS development stretches back to the early 1990s, driven by erstwhile Apple executive Jean-Louis Gassée who founded the company after quitting the Mac maker. Just as Steve Jobs had in the previous decade tried to out-Mac the Mac - that time with the NeXT box and NeXTStep OS - so Gassée tried to pull off the same trick, this time focusing on a media-friendly hardware and OS combo that would appeal to Apple's customer base of content creators. 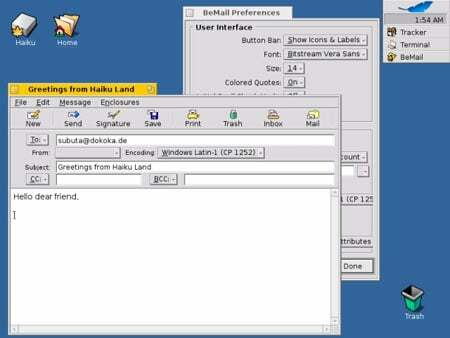 BeOS' pitch was full pre-emptive multi-tasking, allowing it truly to run multiple applications simultaneously rather than kludge it the way the inferior co-operative multitasking, pioneered by the Mac OS, did. BeOS was also ready for multi-processor systems and had adopted multi-threading and even a journaled file system. It was object-oriented, with the API coded in C++. Wikipedia notes that the first versions of BeOS ran on AT&T's Hobbit processor, but the operating system really kicked off when it was ported to the PowerPC in the Developer Release (DR) 6 form in January 1996 running on the PowerPC-based BeBox. By the end of the year, however, Gassée had abandoned hardware - another move Be shared with NeXT - and was trying to persuade Apple to buy the company. Apple's motivation for doing so was the need to jump-start the development of a next-generation incarnation of the Mac OS, its own project, 'Copland', having come undone. In the end, Apple bought NeXT, now promoting NeXTStep and OpenStep on Intel-based systems. Jobs returned to his old firm; Gassée didn't.